If you’ve just completed your waste packaging report, or reviewed your packaging use for 2018, you may be shuddering at the volume of packaging that has been used. Packaging is necessary to protect goods, but in the words of Bob Dylan, ‘the times they are a changin’. There are many solutions out there that do more with less, meaning you can protect goods with less material than previously used. If you use stretch wrap, this is a great product to start targeting your reduction. Low micron performance machine applied film can offer the same load containment as a higher micron stretch but with less wraps, significantly reducing the weight of film used to wrap each pallet. R Connect software is also available for Robopac systems to ensure that the machine is optimised to wrap using the minimum material. It sends an alert if a machine has been set to run below optimisation, ensuring material control at all levels. If you are using hand pallet wrap to wrap 15 or more pallets per day, then it could be time to consider switching to a machine. Stretch wrap automation ensures that the wrap is stretched to capacity before application, this reduces the amount of material used per wrap of each pallet. As well as the environmental benefit it also delivers cost savings – you’re using less material. Professional analysis can help find the right material to maintain load stability by analysing your pallet profiles, weights and wrapping machines. A pallet wrap analysis is quick, easy and causes minimal disruption to your packing operation. Do all of your boxes fit the products they are shipping properly? If you take a one-size fits all approach, then it may be time to rethink your boxes. The size of the box can also be affected by the board grade and fluting used – is it still necessary for the box to be double wall for example? Developments in corrugate board means that some “lighter” single wall boards can provide as much protection as traditional double wall material, offering the opportunity to take size and weight out of the pack. Always ensure that your pack is fit for purpose and offers adequate protection. A packaging professional can help you identify the best solution for your products. Gummed paper tape is a great way to demonstrate your environmental credentials as it can be recycled along with corrugate board without having to be removed. As it forms a strong seal, you can use less material too as it negates the need to H tape boxes. If you use an automated dispenser, you use even less material as it dispenses pre-programmed lengths to ensure the operator only uses what’s needed. Paper voidfil provides great protection for products and makes it easy for end users to recycle. If suitable, you could opt for a die cut Kraft paper which creates a flexible 3D honeycomb structure to form a protective layer, like Geami. The paper has small slits in it so it stretches the paper, meaning that you don’t need to use as much paper to ensure protection. You could also consider switching to an inflatable packing like Airsac, as it is air filled it uses 2% material and 98% air. The pack can be easily deflated and recycled at your local supermarket with regular carrier bags, as well as being reused. 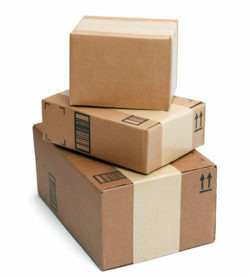 If you are using standard stock packaging and cutting it to size, then consider a switch to made-to-measure packaging. For example, if you are buying stock size pallet edge protectors and cutting them down to fit non-standard pallet heights, how much material are you wasting? It’s not only labour intensive for the packer but also for the recycling loop, you’re manufacturing then recycling unused product. If you are interested in reducing the amount of packaging you use or, switching to more eco-friendly products, then contact our team at Macfarlane Packaging today to find out how we can help.